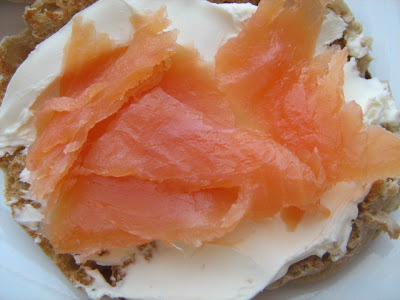 I love smoked salmon and Aldi cream cheese. Aldi's is usually less money than the other markets and for not being organic, it aint too bad. Stick it on a toasted Thomas' double fiber muffin and it's nummy. And, 20% of this little muffin is fiber. I love that. I haven't tried making homemade English muffins yet but that's something I look forward to. For now, I'll continue enjoying these little 5 grams of fiber treats. Hope you're all eating something yummy. Meanwhile, check out Of Cabbages and Kings Food Blog. Great guy. Great photos. And, he even snagged a picture of a 40 foot Wonder Woman. You can also find Bartender at his Double 0 Sven blog. Thanks, Bartender. Great blogs. Great food. Great fun. I love salmon, so the idea of eating it smoked is appealing, but it looks so darned raw and slimey! Those muffins and cream cheese sure look yummy, though. Raw yes, slime zero. At least the one I buy is slime-free and oh so yummy. I want this for brunch! Only I'd add a few capers on top. Never ate capers. Or, if I did, I don't recall. Wow. I love Salmon and so do my kids. I love all sorts of ways to prepare it but favorite was this medium rare fillet covered in a celery root cream sauce. I think there was a touch of tarragon in it too. It was so good. Yous looks so good too. I love smoked salmon and could eat it all day. I want to smoke my own sometime. Smoking your own salmon. That would be cool. And celery root cream sauce. That sounds very good. I also love homemade salmon burgers with an caramelized onion mayo on homemade bread. You can place it finely shredded in a white wine sauce to go over chicken breast but with brown fibre rich bread and lemon juice it's just as good, nice one Whisk or should I say Tim's SWMBO. Hey listen here, Lurker: I'm only that when it comes to editing. Okay, I'm also that when it comes to fiber. I can't help it. I love fiber-rich foods. You called it. Much appreciated for the links! I adore smoked salmon with a hint of lemon juice! Sure thing. Love those photos. Great blog. Me too. I love it even more when on sale. Angry's in a playful mood today. @ Tim Brannan & Whisk - If you smoke it, why not fish for it too? I've never caught a salmon, but right there is where the link between life and food becomes very clear. I had no idea Bartender had that blog, but I'm off there right now. Hi Christian: You tease your wife, that's fun though. Hope the house is doing well and thanks again for sending us the latest issue of your zine. Hi Porky: Yes he is. He's about to be teleported a bucket of something, alright. We have a few bears that travel through our back woods. Maybe we can hire a few of them to catch us some salmon. Glad you found Bartender's blogs. Some fun stuff. And, please do check out the 40 foot Wonder Woman. She's just too cool. I love this food, to !!! Greetings, Magda. Thanks for dropping by today. I do love some smoked salmon now! Good eats. Thanks for the drop-in Alex. Smoked trout is pretty good too, but it has a sharper taste though. I've been craving smoked salmon for a while now... I'll have to get some soon after seeing those yummy photos! This is my Mother's Day and b-day breakfasts every year. I love it. Lately, I'm adding thinly sliced cucumbers. I know, cucumber in the morning, but it is so good. And red onion. Have to have thinly sliced onion. So yum. Makes me hungry just looking at it. My friends hate Salmon with cream cheese. I feel that it is one of the greatest foods ever. So simple yet so tasty. Mmmmm. I could eat that right now. I never liked salmon until my daughter made tiny tea sandwiches for High Tea with salmon, capers and chopped onion on buttered bread. Boy were they good. Next to the cucmuber and tarragon sandwiches they were my favorite that day. Now I force myslef to eat baked salmon for health reasons. I don't love it but I odn't dislike it either. I guess I've come a long way with my eating habits. 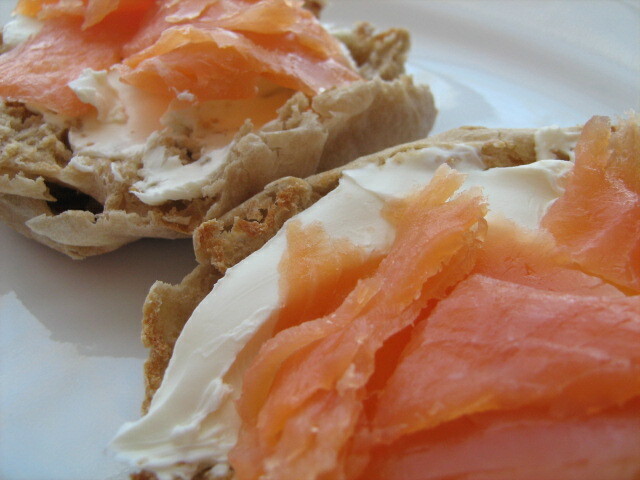 I don't care for Salmon with cream cheese though I like it lots of other ways. I love English muffins and like you, I haven't tried to make my own though I bake all sorts of bread and rolls. Thank you guys. I enjoyed reading all of your comments when I got home from the shop, last night. Now I'm thinking of new things to do with the smoked salmon. That is, the next time it goes on sale. It's later in the afternoon and I just ate the last of my smoked salmon. And you know what? It was nummy. I knew I would get here too late to have some. Also, I wish your pictures showed up on my google reader! I often forget to click through. I'm sorry to hear the pictures don't show up. Next time I'll save the last serving for you. wow I love this salmon treat! With a light arugula salad, this would make a really wonderful lunch! That does sound good. Nice to see you here. Welcome to my little corner of the Internet.